In the DC Comics world, I’ve always been a fan of the ‘Greens’ — Green Lantern and Green Arrow. This may have come from reading those great, topical, relevant Green Lantern/Green Arrow comics in the 70’s with the fantastic Neal Adams art. But whatever the reason, I’ve periodically picked up an issue here and there to try to keep up with the stories. 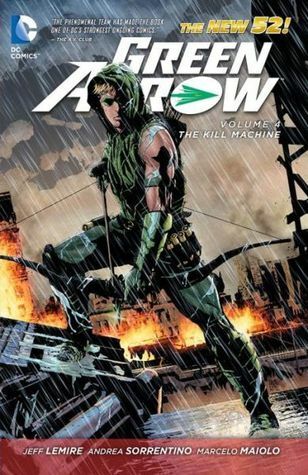 This particular graphic novel seems to feature a rebooted Green Arrow, which is more in line with Arrow television show on the CW channel. And yet…it’s not quite the same as the television rebooted character, which is a little distracting if you, like me, are familiar with both. The Kill Machine‘s Green Arrow works in a dark, gloomy setting, wonderfully illustrated by Andrea Sorrentino, which evokes shades of Batman. But Arrow/Oliver Queen is very much not Batman. This Green Arrow is immature. He suffers some from the little boy syndrome in that he is living and fighting in the shadow of his father. Ollie loses control of the industry his father built. Throughout the novel, he is surprised by information he learns about his father and his family. He is bested, time and time again. His aim is off, and he gets beat up by a ten year old girl. This is not a mature, super-heroic Green Arrow. And yet this is a nice beginning, a nice reboot, to a Green Arrow that actually has growth potential. As much as I liked the golden, cloven goatee’d Oliver Queen, starting over allows the reader to share in the growth of a character. However, based on what we have in this book, we’re living in a dual world… readers are likely to buy it because of familiarity with the established character (old world), yet he has hardly any of the skills or maturity to actually be a superhero at this time (new world). I don’t believe in the Oliver Queen of “Killing Machine.” I don’t see the drive, or the know-how … only the slightest bit of skill. Certainly a reboot needs to build a character from the ground up, but this character, in this book, shouldn’t become a super-hero. The art, as I said earlier, is beautiful. The brooding darkness fits the story well. Sorrentino uses small, rectangular ‘targeting’ panels to emphasize a drawn moment. This is interesting at first, but I grew bored with the effect by the end of the book. The psychedelic sequences were tremendous, and the two-page spread is like something pulled from the 60’s and worthy of taping to your bedroom wall. I’m clearly torn with this book. There is much to like here, but it’s almost as though the character isn’t ready for his own book yet. Looking for a good book? This graphic novel re-boots the Green Arrow character with wonderful art, but the character himself seems a little immature to have his own title. I’d wait a bit and check in on him again when he’s grown some.